Arrange graham crackers in single layer in ungreased jelly roll pan, 15 1/2x10 1/2x1 inch. Heat brown sugar and butter to boiling in 2-quart saucepan. Boil 1 minute, stirring constantly; remove from heat. Stir in vanilla. Pour sugar mixture over crackers; spread evenly. Sprinkle with pecans. Bake 8 to 10 minutes or until bubbly; cool slightly. Cut between graham crackers into bars. 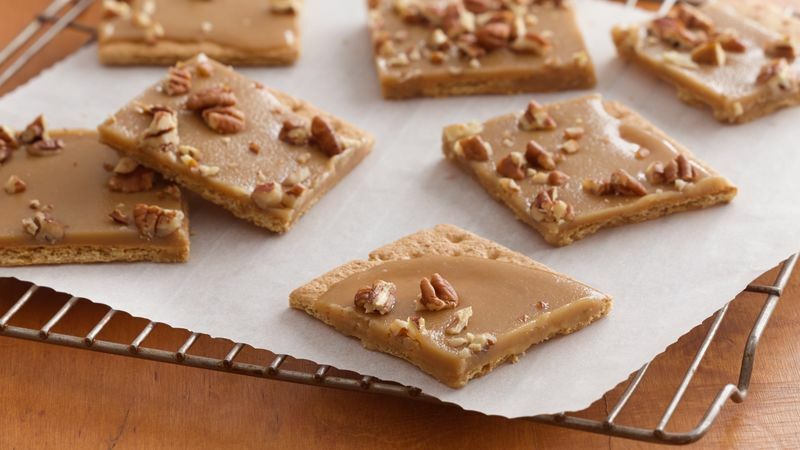 Praline most commonly refers to almonds or pecans coated with caramelized sugar. This treat is thought to have originated from Louisiana where spices are not an uncommon addition to this sweet, crunchy delight. Don’t get burned! Use a wooden spoon and a heat-resistant rubber scraper. All metal spoons can get very hot while stirring.